Chelsea manager, Antonio Conte, has apologised to referee Neil Swarbrick and fourth official Lee Mason, after he was sent off during Wednesday’s 1-0 win over Swansea. 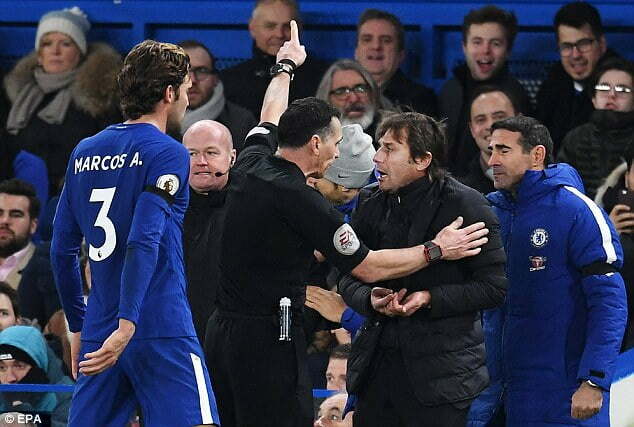 Conte was dismissed from the touchline for the first time in his Chelsea career shortly before half-time, after protesting the award of a Swansea goal kick and questioning the visitors for time wasting. The Italian was seen shouting in Mason’s face, as he took his frustrations out on the fourth official. “It’s right to apologise for what happened during the game,” Conte said. “During the game, in the first half, I saw that Swansea were wasting time. I said this a few times to the fourth official. “At the same time, I didn’t see something change. I was frustrated for this situation. I tried to tell again, but then the referee took this decision. The Football Association will await Swarbrick’s report, before deciding on whether it will take further disciplinary action against Conte.